Welcome to Dickinson Ready Mix Co. & Concrete Products, located in Dickinson, North Dakota. We also have a second concrete plant located in Killdeer, ND and a third concrete plant located in Beach, ND. Dickinson Ready Mix provides top quality concrete to meet all your concrete jobs. We offer Ready Mix Concrete in the following areas: Stark County, Dunn County, Billings County, Golden Valley County, Hettinger County, and Slope County. 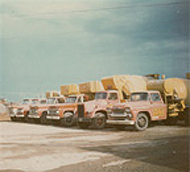 Dickinson Ready Mix Co. & Concrete Products began operations in May of 1950 under the name of Ready Mix Co.
We maintain a fleet of trucks large enough to handle all your jobs large and small. We pride ourselves on customer service for projects of all sizes – from the one yard dog kennel to the commercial buildings – no job is too large or too small! Our company is structured to deliver effective and efficient customer service. Our effectiveness comes in the form of a dedicated production team of Delivery Professionals, Plant Operators, Dispatchers, and Customer Service Representatives and is supported by a very capable Sales and Management Team. Their knowledge of concrete, the markets we serve, and the equipment we operate help to ensure a safe and profitable experience for our customers. Our efficiency comes from our continuous technological improvement, our strategic plant locations that enable us to serve the 10 counties surrounding the Dickinson area, and the after-sale support provided by our Business Office Team. Our intention is to create a work environment that attracts and retains dedicated people by meeting their needs through the pursuit of excellence. The execution of that pursuit comes through establishing high expectations, creating a positive climate, respecting the individual, demanding continuous improvement, and providing professional development and career opportunity.